This research study was designed to examine the effect of spiritual well-being and spirituality on state and trait anxiety. Two hundred and thirty-eight adults in the USA were surveyed using the State–Trait Anxiety Inventory, Duke University Religion Index, Spiritual Well-Being Scale, and Participant Questionnaire. Results indicate that spiritual well-being can predict 39.1 % of an adult’s state anxiety and 37.9 % of trait anxiety. 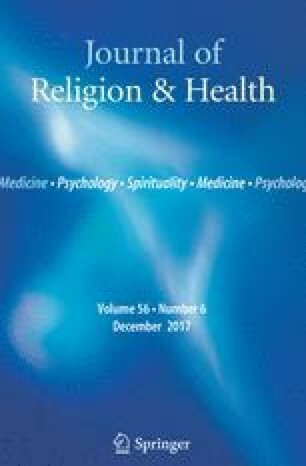 Furthermore, frequency of religious attendance, frequency of private religious activity, and intrinsic religiosity can predict 6.2 % of an adult’s state anxiety and 8.6 % of trait anxiety. Recommendations for researchers and implications for clinicians are discussed. Special thanks to our statistician, Dr. Sue Kopel. Ellison, C. W., & Paloutzian, R. D. (1982). SWB scale. Retrieved from www.lifeadvance.com. Swinton, J. (2001). Spirituality and mental health care. London: Jessica Kingsley Publishers. Retrieved from http://www.ebrary.com.